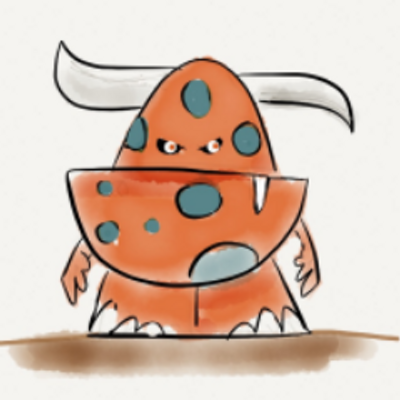 I'm building an uber-exception handling system for all of our apps at work (basically handle unexpected exceptions and post them to out bug tracker, JIRA) and wanted to clear up some confusion on the differences between unhandled exceptions. 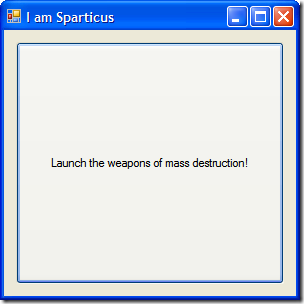 As an FYI, this information is just for WinForm apps. 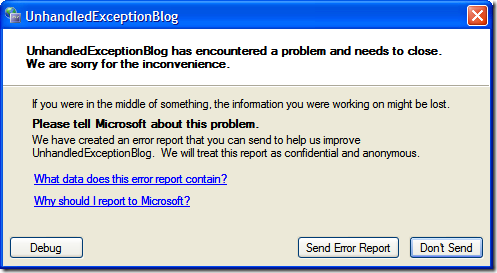 That's the built-in exception assistant Visual Studio provides. It kicks in when running your app from inside the IDE and lets you inspect your system. At this point you're basically screwed and something terrible has happened, so this is your last chance to maybe see what went wrong. Not as descriptive as the exception assistant, but more intuitive if you just want to motor along (say to your own handler which is what we'll do). If you set it to ThrowException, then your CurrentDomain_UnhandledException method is called (even before the Visual Studio IDE gets ahold of it) and the Application_ThreadException method is never called. If you set it to CatchException, then your Application_ThreadException method is called. If you're running inside Visual Studio, the IDE steps in before this with it's own exception handler first then control is passed onto your method if you continue with execution. Your app generally shouldn't report information to Microsoft (unless you're really important), but this is what happens when running your app in normal user mode rather than developer mode. I'm not sure if there's a way to prevent having this bad boy popup on you when you hook into the AppDomain event handler (feel free to chime in on the blogs comments if you know how). Hope that clears up a little on how exceptions work and the different behaviours you can get out of them. Happy exception handling! Look up the usage of the legacyUnhandledExceptionPolicy option in your application's XML configuration file. When you enable legacy handling, the application will not terminate when unhandled exceptions occur. This allows your UnhandledException handler on the AppDomain to do whatever you like, including logging the exception and carrying on with execution. Funny how this is a topic my team is also looking at. 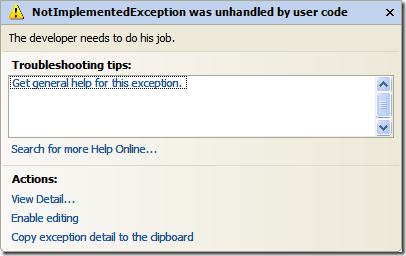 I am curious if you or anyone else has a need for non-exception error handling? We often have batch jobs completing tasks and audits where a validation error may hit, but we don't want to throw an exception. We still want the application / batch to continuing running, but log any validation errors. 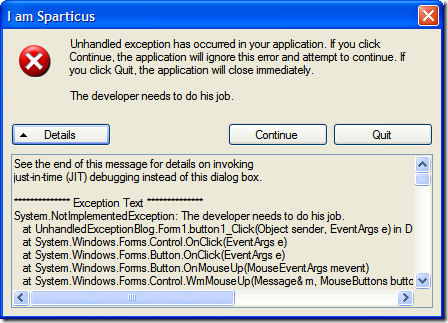 We are looking at creating delegates for errors that require user intervention on UI based application. On batch jobs, we are looking at creating a dictionary of validation error types. After the job completes, read the dictionary and process validation handling / logging on each type in the dictionary (each type may have different logging methods). Bil, Good stuff, Nice post. You can prevent an application from reporting to Microsoft by using the WerAddExcludedApplication function. As Daniel says, though, you can sign up for winqual.microsoft.com and get at your application's errors anyway.